Both celebrate the idyllic locales of summer and feature temple mandarin (a truly rare essence custom-distilled alchemically in pure silica glass). Created by perfumer Alexandra Balahoutis, these fragrances will transport you to the very essence of sunlit, island leisure. Tahitian Honey ~ "Inspired by a summer holiday in Tahiti", with notes of ginger, temple mandarin, plumeria, resins and honey. $370 for .25 oz Pure Perfume. Vacances ~ "Inspired by a leisurely afternoon by the Caribbean seaside", with notes of temple mandarin, hemp, jasmine, cedar, black copal, black currant and honey. $385 for .25 oz Pure Perfume. Ouch, those prices! I’d love to try them if they ever came out in an edp, though (at presumably cringe-worthy but maybe not bankruptcy-inducing prices). They both sound fantastic. I know. I absolutely cringed when I read the prices as the Tahitian Honey sounds really nice. But not *that* nice. They do both sound wonderful. I can’t afford them either. I thought the same thing. Gosh…$370..wow. Okay, just googled temple mandarin to find out it’s a cross between a tangerine and an orange. The Tahitian Honey sounds gorgeous but the price makes me gasp. And the “custom-distilled alchemically in pure silica glass” makes me roll my eyes. OK, I think my respiration and pulse have returned to normal…I was really liking the list of notes for the Tahitian Honey, but then I got a look at the price–WOW! $370? And for only 1/4 oz.? I have never tried this line (and now I guess I know why), so they may be wonderful, but I may never know. I am always hesitant to try things like this, even if I can test them for free, because I am afraid I will fall in love with the fragrance and not be able to afford to actually buy it. I do hope the price really reflects the quality and cost of the ingredients, and is not merely an attempt to create artificial exclusivity. I guess now I get an idea of just how much of a luxury perfume was prior to the introduction of synthetic fragrance chemicals in the late 19th century. Not gonna say anything new (Tahitian Honey sounds good, price is too much for me) but only can test in the store??? I’d love a sample. I am not too afraid of falling in love since I’ve tried many different ones and realized that I am just as likely to fall in love with affordable stuff as unaffordable, and I am just as likely to shy away from affordable stuff as well as expensive exclusive stuff. TPC sells samples and decants of other fragrances from this line, so they might get these in. They do offer a lot of stuff that is supposed to be limited distribution , such as the city-exclusive Le Labo scents or the Serge Lutens non-export selections. She does do EdPs of some (maybe most) of her scents, and they’re MUCH more affordable. I have no idea to what extent the price is “reasonable”, but she is distilling her own materials, and the brand does not make a huge deal about either luxury or exclusivity, so frankly the prices don’t turn me off at all. I just can’t afford them! Perfumista’s friend: Now that the price of perfume is so high, does that mean you will stop buying perfume? 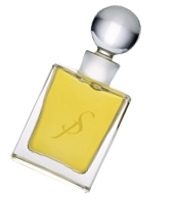 Perfumista: No, it means I will be a lot thinner! I have two samples from this line (I’ve no idea of the names) that I ordered from TPC (received in their grab bags of 20 carded manufacturer samples). I do remember liking the two I tried but wasn’t salivating for a bottle. Guess this is a good thing as I had no idea how much these cost. Although, I’m a novice and my nose is everchanging its’ likes/dislikes. Maybe I should re-visit these samples tonight…but I don’t think I’d ever buy a fb with that price tag, not as long as there are samples/decants on offer. The notes sound lovely, and I’m always curious about small scale, low volume of production scents. When I read “custom-distilled alchemically in pure silica glass”, I thought this was a fancy way of saying “distilled in pyrex”, but it turns out that there is pure silica glass, also known as “fused quartz”. I learn a new thing every day! The labs I’ve worked in have just used pyrex, so this fused quartz is fancy stuff indeed – a small flask runs around $50.